Earl Thomas warms up for Sunday’s game. The Seattle Seahawks played the Dallas Cowboys in a NFC showdown Sunday, December 24, 2017 at ATT Stadium in Arlington, Texas. With the Seahawks reporting back to training camp today and camp starting on Thursday, Bob Condotta and Kate Hairopoulos, the Cowboys beat writer for the Dallas Morning News, discuss Earl Thomas' holdout and the odds he'll end up in Dallas or show up for training camp in Seattle. The Seahawks report for training camp Wednesday, and training camp opens Thursday. 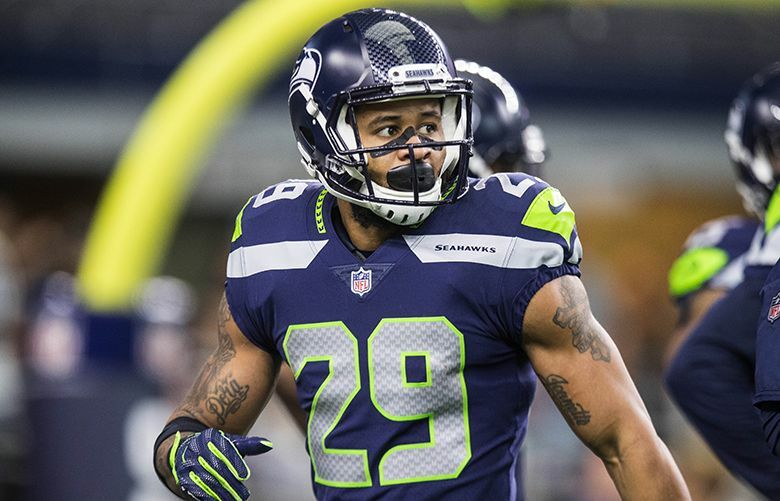 All signs point to Earl Thomas continuing his holdout. But as we wait for the situation to evolve, here’s a look at all the significant issues at play in the Thomas situation in a question-and-answer format featuring Bob Condotta, who covers the Seahawks for The Seattle Times and Kate Hairopoulos of The Dallas Morning News, who covers the Dallas Cowboys — the team thought most interested in trading for Thomas and a team Thomas has made clear he would like to be a member of someday. 1. We know Earl Thomas is interested in the Cowboys because he grew up in the state and liked the team as a fan growing up. What are the specific reasons — other than that Thomas is a really good player — that the Cowboys would be interested in Thomas? Kate Hairopoulos: His flair for the dramatic – now (in? )famously running toward the Cowboys’ locker room at A&T Stadium after Seattle knocked Dallas out of playoff contention last Christmas Eve – would suit team owner Jerry Jones just fine. The Cowboys haven’t had a safety of Thomas’ caliber in years. His experience, leadership and ability could help transform a young, promising secondary. Playmaking on the back end, including forcing turnovers, is still lacking in Dallas. While the team is excited about the players it loaded up with over the last couple drafts, it’s fair to wonder if Jeff Heath (undrafted in 2013), Xavier Woods (sixth-round pick in 2017) and Kavon Frazier (sixth-round pick in 2016) are ready to handle game in, game out responsibilities at safety. Byron Jones, Dallas’ 2015 first-round draft pick, is moving back to corner. Thomas’ presence and familiarity in former Seattle coordinator Kris Richard’s system would only help second-year corners Chidobe Awuzie and Jourdan Lewis. The Cowboys defense appears on the verge of breaking out – a player such as Thomas could be the difference in making it happen. 2. The conventional wisdom is that despite whatever interest Dallas has had in Thomas the Cowboys did not want to offer more than a third-round pick for him before the draft. Is there any reason to think Dallas would suddenly up its offer? KH: Nothing about this situation will be “sudden.” The Cowboys are slow-playing the possibility of getting Thomas, and there’s a couple of reasons why. Maybe they really do feel strongly about the young guys they already have in place. A couple weeks of training camp will be telling. Same will hold true for whether Thomas continues to hold out. Dallas is interested, but it’s going to have to be the right situation. As my colleague David Moore has reported, that could look like Dallas offering a conditional third-round draft pick that could improve to a second-round pick based on snaps and games played in 2018. If you look at the Cowboys’ history, they’ve been willing to take chances on their second-round picks — they drafted LB Jaylon Smith in 2016 after a career-threatening knee injury. They went with DE Randy Gregory in 2015, despite a failed drug test at the combine. Thomas would seem worth a second-round pick, particularly a low-round pick if things go according to plan this season. 3. What has been the general fan reaction in Dallas to Thomas trade rumors? Do most fans want the team to do what it would take to get Thomas? KH: Cowboys Nation loves Earl Thomas. The aforementioned dramatic “If y’all have the chance, come get me,” and Dallas’ lack of a super star at the position means any mention of Thomas-to-Dallas draws major attention. The Cowboys, though, have been draft-based and fiscally responsible in recent years and some will wonder about the prudence of paying for a soon-to-be 30-year-old who has missed seven games to injury over the last two seasons. 4. Dallas doesn’t appear to have much cap room and Thomas is thought to want $13 million a year, at least, in a new contract. Cap room can always be manufactured if a team really wants to add a player, but how difficult would it be for Dallas to take on Thomas and his potential salary? KH: It’s surprising for sure, but Dallas will actually rank among the NFL teams with the most available cap room next season. It has room this season, in part, by releasing receiver Dez Bryant and signing right guard Zack Martin to a long-term deal. While it’s known for kicking the can down the road on contracts, restraint and reliance on the draft instead of free agency have helped ease the salary cap pressure. That said, the Cowboys have been responsible knowing they have mega deals coming up with defensive end DeMarcus Lawrence (playing on a $17.1 million franchise tag this season) and quarterback Dak Prescott, who could join the ranks of QBs with $100 million deals. Thomas would have to agree to terms that make Dallas feel comfortable too. 5. Knowing what you know right now, do you think Dallas would be more apt to try to trade for Thomas now or wait it out and see if he could become available as a free agent after the season? KH: The Cowboys’ best shot could come this season, when they don’t have to deal with Thomas hitting the open market, as he would a year from now. As we’ve alluded to, Dallas hasn’t been a major player in free agency in years and doesn’t want to overspend. The Cowboys are interested in Thomas, but the next couple weeks of training camp will certainly be telling. 1. How did we get here? Thomas was a part of the Legion of Boom brotherhood and a key player for a Super Bowl champion. Why has it gotten so ugly and would Thomas really hold out for all of training camp and into the regular season? Bob Condotta: It’s gotten to this point for the same reason hundreds of similar contract situations have gotten to a similar point throughout NFL history — Thomas wants a lot more money than the Seahawks are willing to give him right now. Thomas wants to be the highest-paid safety in the NFL — topping the $13 million of Kansas City’s Eric Berry with some rumblings he wants quite a bit more. Seattle is reluctant to do that with Thomas turning 30 before next season. Seattle’s situation has also obviously changed over the last 12-18 months or so as a number of veterans have moved on for a variety of reasons putting the team in a situation of “retooling’’ — the team’s word — or rebuilding, the word favored by most everyone else. If this were two years ago I have little doubt this situation wouldn’t be as it is now. As for whether Thomas will really hold out into the season, that’s the $1 million question (or maybe $13 million question?) that is hard to definitively answer. The Seahawks appear to be banking that Thomas won’t do that. Certainly, they appear willing to see just how serious Thomas is about holding out and then maybe changing their plans accordingly. 2. Thomas has missed seven games over the last two seasons. How good can he still be as he approaches his 30’s? BC: This is the other question that’s hard to answer that certainly looms over all of this. Thomas had just set a Seahawks team record for most consecutive starts by a defensive player in 2016 when he suffered a hamstring injury that caused him to miss a game against Tampa Bay. He has since suffered two more injuries that have also caused him to miss games and that is undoubtedly playing in to how the Seahawks are handling this. Seattle gave Kam Chancellor a big extension prior to last season and then saw him suffer an apparently career-ending injury after nine games. Seattle also saw Richard Sherman suffer an injury that might alter his career for good and saw defensive end Cliff Avril suffer a career-ending injury. Age and injuries take their toll on players and the Seahawks have gotten a really big dose of that over the past year. None of Thomas’ injuries are ones that are lingering into this season. But simply that he has suddenly had a few is a concern for the Seahawks. As for his play, there was no sign of a dropoff last season. But among Thomas’ greatest attributes have been his speed, quickness and acceleration and losing even the tiniest bit of a step is inevitable as he enters his 30s. He also has had a rare anticipation to sniff out plays, and he might be able to compensate mentally for any losses physically. The question will be whether he can do that well enough to warrant the salary he wants. 3. How much do you think Thomas’ relationship with Kris Richard would impact his desire to be in Dallas? Richard’s hire has caused a buzz here — what did you see from him during his time in Seattle? BC: I’d say it helps but is hardly the key to any of this. Thomas has talked for years of what a big Cowboys fan he was growing up in Orange — in 2015 before a game against the Cowboys he said he still considered himself a fan of the team and fondly recalled an instructional football video he had as a kid that featured Troy Aikman, Emmitt Smith and Deion Sanders. I think wanting to play for what he considers his hometown team and in his home state – he also went to college at Texas — is the biggest part of this. But there’s no question that there would be added comfort going there for Thomas due to his relationship with Richard, who was Seattle’s secondary coach before becoming the DC and was here for all of Thomas’ career so far, and that his role in the defense would likely be similar to what it has been every year of his career to date. 4. Kam Chancellor forced a contract extension, and that didn’t work out so great for Seattle. Is that influencing the Seahawks as they deal with Thomas? Doesn’t the team still hold all the leverage, with the exception being that if they don’t move him this season, they risk losing him for little in return in free agency after 2018? What do you think it would take for Seattle to trade Thomas to Dallas? BC: I’m gonna disagree a little with the premise of the first part of the question. Chancellor held out in 2015 when he had three years remaining on his contract. The Seahawks’ policy has always been to not redo deals until a player is entering the final year of his contract. Chancellor returned in 2015 after two games without the Seahawks doing anything contractually. They then re-upped Chancellor before camp began last season as he was entering the final year of his contract — the same time frame as they have done for all of their core players during the Pete Carroll/John Schneider era. I think Chancellor’s holdout was irrelevant to him getting the deal he did last season — they also had re-upped Michael Bennett late in the 2016 season and at the time appeared to just want to keep the gang intact to go after another Super Bowl in 2017 and beyond. But you are correct that it didn’t work out great for Seattle. In fact, it could hardly have worked out worse as Chancellor’s career appears over, ending before he even entered the first of the three years of the extension (his contract, originally set to end after the 2017 season, was extended through 2020). The Seahawks are likely going to have to pay Chancellor $12 million over the next two seasons for not playing. More relevant is that that was the third contract for Chancellor, as was the last deal that Bennett received, which also did not turn out all that well — the team traded Bennett last March and ended up paying him an extra $8 million it didn’t really have to. A third contract the team agreed to with Marshawn Lynch in 2015 also didn’t turn out so well — he played just one more year in Seattle and the Seahawks basically gifted him $5 million in bonuses they didn’t really have to. To me, it’s the accumulation of those contracts — and that the team is moving in a different direction with younger players at the expense of a lot of the big-name vets — that is the bigger reason for hesitation regarding Thomas than merely Chancellor’s deal. As for losing Thomas for little, that apparently is exactly why the Seahawks are holding firm to their demand that any team wanting Thomas give up at least a second-round pick or its equivalent. Seattle knows that at the worst it would likely be eligible for a third-round comp pick in 2020 if Thomas were to sign after the season with another team as an unrestricted free agent. So for now, Seattle would rather hang on to Thomas for another season when he is 29 and in his prime and then maybe get a third-round pick for him in 2020 instead of dealing him for a third-round pick (or lower) now. An offer or a first- or second-round pick would obviously be a different story. Should Thomas really hold out until deep into the season, then maybe the dynamic changes. But the Seahawks saw first-hand that a lot can still be gotten for players who are holding out as it was Seattle that gave up a second- and a third-round pick last October for left tackle Duane Brown after he held out and missed Houston’s first six games before returning. Simply put, Seattle still has a lot of options here so there’s zero reason to just take the first offer that comes down the road. 5. Since Thomas raced toward Cowboys coach Jason Garrett and the Dallas locker room late last season, he’s been outspoken and public about possibly leaving Seattle. How are the 12s responding to Thomas and would a contract extension even heal the relationship at this point? BC: Seattle fans have definitely grown weary from the way the relationship between the organization and some of the team’s most iconic players has frayed over the last few years, and the situation with Thomas is the latest blow. The Dallas situation was bizarre and the talk of the town for a few days both for its bizarreness and what it indicated about the future of Thomas, who had groused a little about his contract all season with his comment to Garrett making even clearer how he felt about things.But Thomas has also been known as one of the team’s more eccentric personalities, and a lot of people initially I think took the Dallas incident as “Earl being Earl’’ (Thomas once famously hugged a ref after scoring a touchdown and, well, you can find the pictures of his wedding online) and being caught up in the moment of a big win in his home state. But as the offseason has progressed with no sign of a new contract and Thomas holding out of minicamp I think many fans now just want the whole thing over with and at this point — having already seen the departure of Sherman, Chancellor, Bennett and Avril — are resigned to the idea that the defense they grew to know and love from 2011-17 isn’t ever going to be the same and that Thomas is likely gone either this year or next year. Fans, though, are also famously forgiving and if somehow something got worked out, I think almost everything would be forgiven (Chancellor didn’t seem to suffer any real public blowback for his holdout, which it could be argued was as big as anything that happened that year to prevent a legit Super Bowl run).